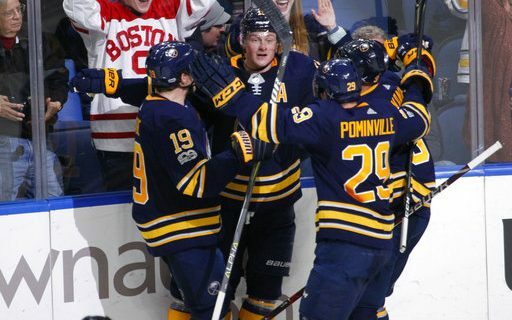 The Sabres are the NHL’s worst first period scoring team. Sports comedian Jeff Wozer has discovered why the team seems so distracted at the start of games. • Players star-struck from seeing that guy from those Empire kitchen countertop ads next to their bench. • Miffed they’re ineligible for 50/50 raffles. • 7 pm starts mean missing Entertainment Tonight. • Mentally exhausted from following Channel 2’s Adam Benigni ever-changing job titles from news anchor to morning host to sports director. • Moe’s Hot Players of the Game promo places undue pressure on players to score. • Distracted from never knowing how much to tip the Zamboni driver. • Ears ringing from Terry Pegula constantly lecturing them before games for ignoring No Gum in Urinal signs. • Distracted from forever wondering why Nick Mendola doesn’t produce a Sabres Rap. • Fear that if they score at the 5:50 mark of the first period causing WGR to honor its Honda CR-V giveaway promotion WGR management will make good on its threat to have Schopp and the Bulldog broadcast their pregame shows from inside the team’s locker room. • Difficult to ignore festering rumor Marty Biron during home game first periods enters team locker room and pilfers through their wallets. For more funny insights on the Buffalo sports world, visit Jeff’s author’s section at Buffalo Sports Page.